It pains me to disagree with a writer I like and admire, but Srdja Trifkovic’s piece on Cardinal Stepinac makes no attempt to explain, much less understand, why Catholics respect and admire this brave Croatian martyr. Trifkovic takes umbrage at Pope Benedict’s treating Stepinac as a “saintly figure” and of saying this about him: “Precisely because of his strong Christian conscience, he knew how to resist every form of totalitarianism, becoming, in a time of Nazi and Fascist dictatorship, a defender of the Jews, the Orthodox, and of all the persecuted, and then, in the age of communism, an advocate for his own faithful, especially for the many persecuted and murdered priests.” But Benedict’s words offer a just appraisal of Stepinac, who did become, once he became convinced of the horrors that were occurring in Ante Pavelic’s Croatia, a defender of the persecuted. As the killings by the Ustasa increased, some Serbs and Jews sought conversion to save their lives. Stepinac responded to this development by writing this confidential circular for his clergy: "When persons of Jewish or Orthodox faith who are in danger of death and wish to convert to Catholicism present themselves to you, receive them in order to save their lives. Do not require any special religious knowledge for the Orthodox are Christians like us and the Jewish faith is the one from which Christianity originated. The role and task of Christians is first of all to save people. When these sad and savage times have passed those who converted because of belief will remain in our Church and the others will return to their own when the danger is over". One life that Stepinac did not seek to save was his own. 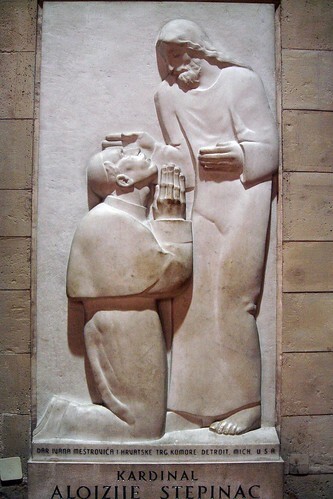 In a May 1943 visit to Rome, Stepinac met the sculptor Ivan Mestrovic (who later commemorated Stepinac with the simple yet moving relief of the Cardinal kneeling before Christ, found in Zagreb Cathedral). Mestrovic urged Stepinac to stay in Rome, warning him that his life was in danger. Indeed, Stepinac could have chosen a life of safety in exile at any time. But he would not abandon his flock, even though he told Mestrovic, “Either the Nazis will kill me now or the communists will later.” It turned out, of course, to be the Communists. After the Communists took power in Croatia and the rest of Yugoslavia, Tito met with Stepinac. Tito urged Stepinac to sever the tie between the Catholic Church in Croatia and the Holy See. This is exactly what the Communists asked Catholics in Ukraine and China to do. Stepinac refused. After this, the killing of priests intensified. Stepinac denounced the Communist persecution, pointing out that the Communists had murdered 273 Catholic priests and imprisoned 169, with another 89 missing. The Communist response to Stepinac’s refusal to break with Rome was to put him on trial for collaboration with the Ustasa. The result of that trial, as with the near contemporaneous Communist trials of Josyf Cardinal Slipyj of Ukraine, Jozsef Cardinal Mindszenty of Hungary, Josef Cardinal Beran of Czechoslovakia, and Stefan Cardinal Wyszynksi of Poland, was a foregone conclusion, even though, as Alexander notes, "Stepinac's lawyer defended him convincingly on a number of other accusations: he showed that Stepinac’s control over the rigorously censored [Catholic] press had been largely formal (and this was later confirmed to the writer by someone who was close to the events); that he had no control outside of his own diocese, or over publications belonging to religious orders.” This is significant because, to this day, most of the accusations against Stepinac are based on articles appearing in the press or the actions of priests outside of his Archdiocese. After the trial, Stepinac spent 5 years in the Lepoglava prison from 1946 to 1951, followed by house arrest in his native village, dying there in 1960. (Stepinac’s doctor was convinced that his death was hastened by the conditions of his confinement, and since his death evidence has emerged that Stepinac was also poisoned by the Communists). The Communists made clear that Stepinac could leave prison to go into exile, but Stepinac steadfastly refused to abandon his flock. In 1994, Pope John Paul II, whose knowledge of Christian life under Communism cannot be questioned, visited Zagreb. He had sought to visit for years, but the Communist authorities would not let him enter because John Paul had made it clear he intended to pray at Stepinac’s tomb. Before finally kneeling to pray at Stepinac’s tomb, John Paul said this of Stepinac: “With his presence, his work, with his courage and patience, with his silence, and finally in his death, he showed himself to be a true man of the Church, ready for the supreme sacrifice rather than deny the faith." These words of John Paul are irrefutable, and provide reason enough for any Catholic to venerate Cardinal Stepinac. It must be said, though, that for writers less balanced than Trifkovic, Stepinac, and the man who made him a Cardinal, Pius XII, have become scapegoats, men to be blamed for the crimes of others. In one sense, this impulse is understandable: the crimes of Hitler and Pavelic were enormous. But the regimes that committed those crimes are long gone, and neither Pius XII nor Cardinal Stepinac bear responsibility for what those regimes did. The portrayal of Pius as “Hitler’s Pope” and Stepinac as “the Patron Saint of Genocide” are lies, lies rooted in Communist propaganda. Neither the Pontiff nor the Cardinal sought or approved of mass slaughter; they did not create the hatreds unleashed by World War II, nor could they control those hatreds. And their critics overestimate what more they could have done even to curb those hatreds. As Trifkovic relates, a guard at Jasenovac, confronted by the imprisoned Vladko Macek, forthrightly confessed that he was going to Hell for what he had done and intended to do again, but added he was happy to go, because “at least I shall burn for Croatia.” Nothing Cardinal Stepinac could have done would have dissuaded such a killer. Indeed, as Alexander notes, the Bishop of Mostar “instructed his priests to tell their congregations from the pulpit that those who murdered, or who misappropriated the possessions of others would not be granted absolution.” The killings in the Diocese of Mostar went on anyway. Similarly, the forthright denunciation of Nazi persecution of Jews made by the Dutch bishops saved not a single Jewish life. Indeed, because the Nazis responded to this denunciation by sending Jewish converts to Catholicism to the death camps (including Saint Edith Stein), the Dutch denunciations arguably cost lives. Their critics also fundamentally misapprehend the primary duties Pius and Stepinac had to discharge. Pius XII’s fundamental duty was to protect and preserve the Universal Church that had been entrusted to him, just as Stepinac’s fundamental duty was to protect and preserve the Archdiocese that had been entrusted to him. Both men fulfilled those duties admirably, under extraordinarily difficult circumstances. They also opposed the barbarism that was engulfing Europe, and helped non-Catholics threatened by that barbarism. But asking Catholics not to honor these men because some non-Catholics believe they did not do more for those outside their flock is, frankly, asking too much.